Pierre Dervaux was born in 1917; his father was a trombonist and his mother a pianist. He studied counterpoint at the Conservatoire National Supérieur de Musique et de Danse de Paris with Jean and Noël Gallon in addition to studying the piano with Isidor Philipp and Yves Nat. 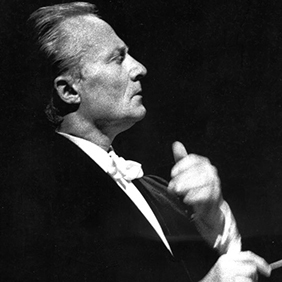 In 1945 he conducted his first concert with the Orchestre Pasdeloup. From 1947 to 1972, he successively conducted the Opéra-Comique and the Opéra de Paris. From 1968 to 1975, he served as artistic and musical director of the Orchestre Symphonique de Québec. In 1971, he became the first director of the Orchestre National des Pays de la Loire, and went on to serve as musical director of the Orchestre Philharmonique de Nice. Dervaux also taught conducting at the École Normale de Musique de Paris and the Conservatoire de Montréal. Jean-Claude Casadesus was one of his students.